But I’m growing a human and let me tell you that is tiring! Also we’re now at the stage of the game where my kid likes to use my bladder as a stuffed animal/punching bag/pillow. So that is some fun right there. So I haven’t actually done much besides grow the little person and relax when I get home, with a dash of internetting too. Halloween is tomorrow and I think it will be another low key year. We hardly get any kids so this year I think we’re putting a bowl of candy out and going on the honor system. I’m super ok with this. Seriously we had 7 kids last year…which might be the most we’ve ever had since we moved here. Funny story the neighbors told us when we first moved in BUY ALL THE CANDY there are so many kids. Liars. It’s a let down to me because I love Halloween. I really like seeing all the costumes and stuff. But our neighborhood is slowly killing the joy of the season for me. Well, that and stores already have Christmas candy out!!! Anywho that’s what’s happening here. Happy Halloween folks! 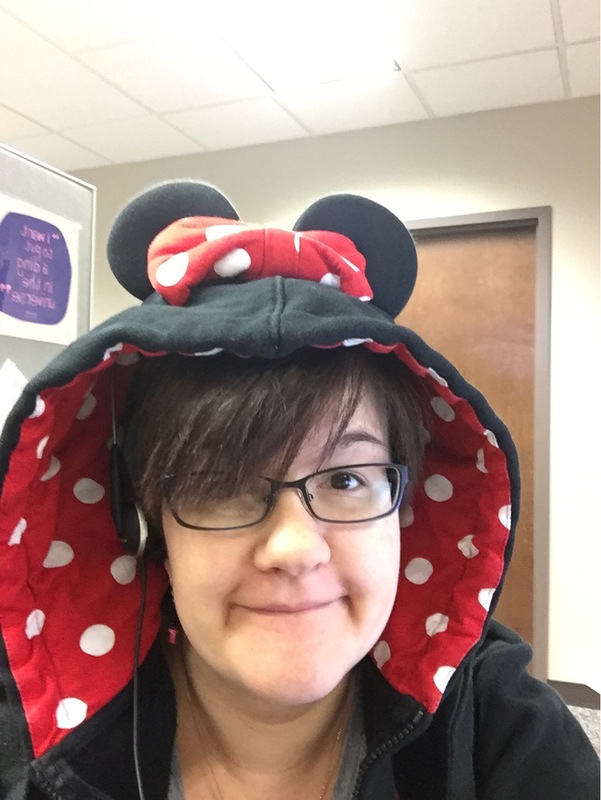 This was the most I could throw together today, my Minnie Mouse hooded sweatshirt w/ears and bow. Previous Previous post: Hey another three day weekend!